Kostroma is one of the most interesting towns of ’’The Golden Ring of Russia”. A trip around the land of Kostroma will produce an unforgettable impression on everyone: picturesque landscapes, monuments of culture and history, wonderful specimens of folk art are waiting for you here. The land of Kostroma is closely connected with many prominent Russian cultural workers such as: Volkov F.- the founder of the Russian national theatre; Pissemsky A.R, Ostrovsky A.N., Nekrassov N.A., Potekhin A.A., Rozanov V.V., Rozov V.S. - classics of the national literature; Kustodiyev B.M. - one of the biggest painters of the Silvery Century; Florensky P.A. - a religious philosopher, who was lost in the Soviet torture-cham-bers; Solzhenitsyn A.I., whose works are known in the whole world now. Russian artistic and cultural traditions were cultivated in the land of Kostroma for centuries. Original and highly artistic monuments of architecture, specimens of skilful metal forging and wood carving have been preserved here. In case you may have some time, visit the surroundings of the town and the villages of Krasnoye and Sidorovskoye, the settlement of Sudislavl, the country estate Shelykovo. The history of these places has deep roots: the names of the settlements are mentioned already in the documents of the 16th - 17th centuries. Wander along the green side-streets and have a look not only at some monuments (the Epiphany church of the 16th cent, in Krasnoye or the Transfiguration cathedral of the 18th cent, in Sudislavl), but also at the buildings, surrounding them: wooden houses with the lacy carving of window casings or stone ones with tracery hammered sheds above the entrance door. And then the world full of exquisite old times will be revealed to you. In Shelykovo - the country estate of A.N. Ostrovsky you will be charmed by the nature of Berendey’s kingdom, recreated by the playwright in the play “Snow maiden”. While getting to know the interior in the museum, you will feel the atmosphere of the country-estate of the 19th century. In the literary museum you will be told about the creative way of the great playwright, about the eternal life of his literary works. Kostroma is considered to be founded in the middle of the 12th century. At that time an active struggle of Russ against Volga Bulgaria for the river trading road began. It was necessary to make the settlements on the river stronger, and in Kostroma, like in many other places, a fortress was constructed. As the excavations confirmed, it stood on the Volga left bank, on a small hill at the mouth of the Volga and the Sula. The legend about the foundation of the town was published in the middle of the 19th century. It runs that Prince Yuri Dolgoruky with the army came to these places, surrounded by deep forests, to protect merchants and traders from the robbers and founded the town on the Volga bank. There are several interpretations of the name of the town. Some investigators consider that it comes from the Finnish word “kostrum” meaning a “fortress”. The others connect it with khorovod “the ancient traditional Slavonic folk round dancing act”, called Kostroma, which was spread in the linen producing areas in the pagan period of Russ. The information about the original settlement is a poor one. Kostroma as a considerable settlement is mentioned for the first time in the Voskresenskaya chronicle in 1213 in connection with the struggle between the sons of Prince Vsevolod Bolshoye Gnezdo. In 1237-1239 Kostroma was won and robbed by hordes of Mongol-Tatars, then reconstructed again. The Kostroma Kremlin was constructed and in 1246 the Kostroma apanage principality was formed. In the 60-70s of the 13th century big insurrections of Russian people against Tatar yoke started there. The town was completely burnt down more than once during invasions of enemies and intestine wars and has preserved almost no monuments of ancient art. Only some religious paintings of that period, in particular: the miracle working processional icon of the Mother of God Feodorovskaya of the 13th century (the Epiphany cathedral in Kostroma), the hagiographical icon “St. Nicholas” of the 14th century (the Russian Museum in Saint-Petersburg), some pieces of small plastic arts, found during the excavations on the grounds of the town and some articles of family life have survived. Meanwhile these few objects let us state that even in those distant times there used to be talented craftsmen who created the local art traditions, developed later and still alive today. Thanks to a very advantageous position on the lively trading road Kostroma turned out to be a big centre of handicrafts and trading in the 16th-17th centuries and one of the biggest towns of Russia. The town was constructed of wood as it was located in the forest part of the country. Frequent fires of the natural calamity size destroyed the constructions. The chronicle runs, that during the fire of 1413 thirty churches were burnt in Kostroma. Such a quantity of churches is a good evidence of a big size of the town. After the fire the Kremlin was constructed on a new higher place of the Volga bank, from which the river was to be seen in a very good way and then it was lower than the town with the stream. The architectural complex of the Kostroma Kremlin consisted of the Assumption cathedral founded in the first half of the 16th cent, and the Epiphany cathedral with the belfry (1776-1791), two dwelling houses (1795-1796) and the fence with the Holy Gates (1767).The Epiphany cathedral and the belfry were created by Stepan Vorotilov - a skilful craftsman and a talented architect. The Kremlin, seen far away from the side of the Volga River, decorated the town and formed the architectural leitmotiv of its central part, being at the same a peculiar visiting card of Kostroma. In 1934 the Kremlin of Kostroma (with the exception of the two dwelling houses) was destroyed in a barbaric way by the Soviets. Instead of it now there is a park, “decorated” by the figure of Lenin - the founder of the Soviet state, put on the pedestal, left from the unrealized project of the monument devoted to the 300 years anniversary of Romanovs. Now it is difficult to judge about the way ancient Kostroma used to look. The documents which have survived and the few drawings let us imagine a queer silhouette of a wooden town with numerous churches among the dense trade buildings with the streets, repeating the pattern of the relief, wooden bridges over ravines and small rivers. The polish intervention, which started in the first years of the 17th century, influenced the state of the town in the negative. In 1608 the Kostroma irregulars of trades’ people joined the rising against the interventionists, organized by the inhabitants of Galich. Kostroma people took an active part in the irregular army of Minin and Pozhar-sky. The epic of heroism of Ivan Sus-sanin is also connected with the struggle against the Polish interventionists. The reconstruction of the town started after the exile of the interventionists. sons were invited to construct palaces and cathedrals in the capital and other cities and towns. Especially far - famed icon and fresco painters from Kostroma used to be, they painted cathedrals in Moscow,Yaroslavl, Pereslavl-Salessky, Susdal in a wonderful way and gradually even a peculiar Kostroma manner of painting was formed, which was really in blossom in the 17th -18th centuries. The Trinity cathedral in the Ipatyev monastery, the Resurrection church in the Forest, the church of St. John the Theologian in Bogoslovskaya sloboda, the church of St. Elijah and the church of Our Savior’s Transfiguration, the church of the Ascension of Christ in the Melnichny lane have survived as a part of the inner life in Kostroma of the 17th century. The Resurrection church in the Forest is a brightest example of a possad type of the cathedral, constructed with the most active participation of the inhabitants of Kostroma. They not only donated the money, but also mostly embodied their steadfast belief in the harmonic mode of life, which is revealed in all its might to a human being only in the church. No matter how traditional the general composition of the Resurrection church might be, the details and the artistic decorum of the building add peculiarity to it. The church is a bright example of the synthesis of arts, when skillful painters, stone - and wood - carvers, smiths worked side by side with architects-stonemasons. Sincere belief in God, shielding their work, created an unforgettable symphony of forms and colors, full of joy and harmony. Porches with the hipped roofs lead to the gallery of the church from the north, west and south in the same way the ancient wooden churches of Kostroma used to be constructed. The primary look of the Resurrection church was even closer to the specimens of the wooden architecture. But in 1871-1873 the church was considerably rebuilt. In all probability the many-colored “in blocks”, painting refers to this period as well. White fretted stone was widely used in the architectural appointments of the fronts and interiors of the Resurrection church. The relieves of the Holy Gates of the church are especially intricate and interesting. The ancient masters embodied their ideas of beauty saturated with the deep religious sense in the skillfully performed lion, unicorn and siren - bird. Special attention should be paid to the relieves, where the birds: the tawny owl (insatiable bird), tearing its breast and the phoenix with the face of a maiden, like symbols of the two possible variations of the human life, are portrayed. The details carved of white stone on the inner portals of the church are very impressive too. The ancient fresco paintings of the monument have survived in the chapel of The Three Bishops: Basil the Great, John the Chrysostom, Gregory the Theologian; on the western and southern walls of the gallery; also in the central cylindrical part (the drum). The artists portrayed events from the Bible, in particular - Apocalypses on the walls of the gallery. The fresco paintings in the Chapel of the Three Bishops are devoted to the excruciating torments of the Apostles’ death also to the scenes from “The Life of Basil the Great”. The other cathedrals of the so-called “possad” type, constructed in Kostroma in the 80s of the 17th century, are much more modest. In 1778, Kostroma became the centre of a vast province (gubemiya). 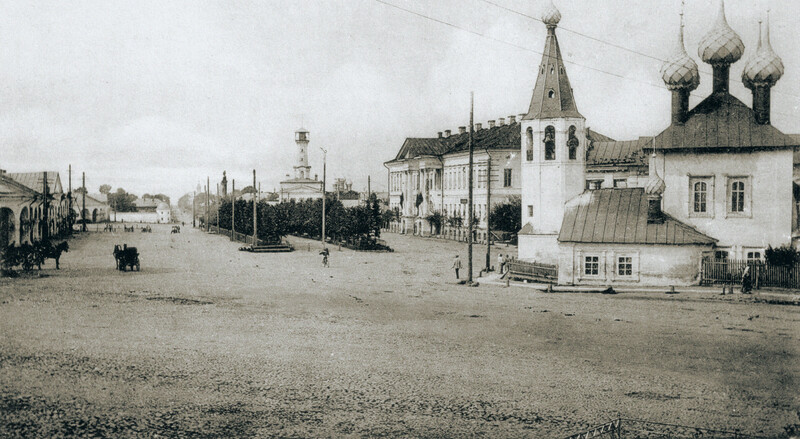 In connection with it the construction of the new administrative buildings, forming the centre of the town was started. The quantity of stone dwelling buildings increased as well. The new building was led according to the general plan of the reconstruction of the town approved in 1784. The advantageous new layout of the town and the circumstance that the great fire of 1773 destroyed the central part of the town let the authors of the project embody it almost completely. That is why we may state that the architectural look of the town was formed mostly at the end of the 18th - in the first third of the 19th centuries. The St. Trinity Ipatyev monastery (closed and destroyed by Bolsheviks in 1918) is one of the main monuments of religious and state life not only for Kostroma. The monastery was founded as a fortress at the confluence of the Volga and the Kostroma (Kostromka) rivers in the 13th century. It represents a compound complex of buildings, the construction of which started at the end of the 16th century and finished at the end of the 19th century .Thanks to rich contributions and donations, mostly of the Godunovs’ family, the Ipatyev monastery was really flourishing and developing. It possessed vast arable lands, thousands of peasants, ferries across the Volga and the Kostroma, numerous shops. However, of course, not the economic, but the spiritual status of the monastery determined its whole life. Besides, this monastery was a living evidence (almost a legend) of the Godunovs’ rights for the throne, confirming the fact that they really were an old noble family, true Christians. Not by chance after the fall of Godunovs at the start of the 17th century, the new dynasty of Romanovs started to patronize it. The mother of the first tsar from Romanovs - Marpha owned a lot of lands in the area of Kostroma. At the start of the 16th century she lived with the son in the Ipatyev monastery. In March 1613, the delegation of Assembly of the Land came there to ask Michael Romanov to be the tsar of Russia. Many precious things were kept in the sacristy of the monastery, unique manuscripts and the first printed books, including the famous Ipatyev chronicle - a copy of one of the ancient collection of texts of Kievan Russ of the 9th-12th centuries - “The Tale of the Temporal Years” were stored in the library. N. Karamzin - a famous Russian historian, found the manuscript in 1814 there. The oldest part of the monastery -the Old Town- exists since the date of its foundation. The stone walls with the towers were constructed instead of wooden ones at the end of the 16th century and then they were made a little bit higher in the 17th century. In the 40s of the 16th century to the western wall of the old Town the so called New Town was joined. There were moats around the monastery, filled up in the 18th century, when the monastery lost its destination of a fortress. The construction of the walls and towers corresponds to the fortification rules of the 16th-17th centuries. The Trinity cathedral has the central position on the grounds of the Old Town. The primary stone building of the cathedral was constructed in 1558. At the start of 1649 it was destroyed by the gunpowder explosion and reconstructed in 1652. Nikon’s reforms influenced the construction of the new cathedral. The gilded iconostasis in five tiers -a typical specimen of the art of the 18th century was done by the group of carvers under the guidance of Pyetr Zolotarev and Makar Bykov. The icons of the three upper tiers are of a stated value. The belfry stands to the west of the cathedral on the main square. Near the western wall of the Old Town to the north from the gates into the New Town, there are the Chambers of Romanovs. Originally, monks’ cells used to be here. While visiting the monastery in 1858 Alexander II ordered to reconstruct the building with the idea to make it suitable for the tsar’s mansions. The reconstruction in the traditions of the 17th century was entrusted to architect F. Richter and since 1863 the Chambers have their modem look. There are many administrative structures and dwelling houses- from the modest monks’ cells to the splendid Bishop’s Palace. The Palace was more than once reconstructed in accordance with the tastes of a bishop and new tendencies in the architecture. Near the walls of the monastery the museum of wooden architecture was set up. The main idea was to preserve and to show some unique civil and secular monuments of folk architecture, also social and household constructions, displaying the way of life of a Kostroma village. Our Lady’s cathedral (1552) brought to the museum from the village Kholm is of a special interest as it is the oldest wooden structure in the whole Kostroma region. The carpenters who built it were very talented craftsmen. The church from Fominskoye will also draw your attention by the belfry built into it. In addition, a very simple in the outlook small chapel is very close to the ancient constructions and reminds of a fairy-tale house. After visiting the monastery and the wooden architecture museum, you may wander along old streets of Bogoslovskaya and Andreyevskaya slobo-das. The church of St. John the Theologian stands in the central part in the Bogoslovskaya sloboda. You will see houses with amusing balconies, window casings and shutters, gates with interesting figures looking like dragons and plants from the fairy tale. While staying here it is difficult to imagine that there are industrial headquarters of a big town with the modem life tempo on the opposite bank. Kostroma is one of the oldest Russian cities and now administrative, cultural and industrial centre of Kostroma Region. The city is located 350 km to North-East from Moscow on the confluence of the Volga and Kostroma rivers. The population of Kostroma is about 270 thousand people. It has a high industrial potential and developed transportation system. Russian winter. The Volga River. Тimur Kostroma Pakelshikov. Photo 2013. Boltaev Sh.Sh. The most important ecotourism development issues. K. Torop. Russian artistic and cultural traditions were cultivated in the Kostroma region for centuries. The book “Ivan Susanin: legends and reality” written by N.A. Zontikov is dedicated to a Russian hero Ivan Susanin. In the past Kostroma held one of the first places in Russia for the number of flax manufactories. It’s been a traditional centre of textile industry and jewelry art. And the city still proudly holds this position. At the same time Kostroma reveals itself in totally different areas, as an industrial city of new directions - machine building and metal industry, electronics and tool-making, furniture and light industries, power engineering, wood-processing, forest, jewelry industries. Kostroma city has extensive connections with municipalities abroad. Twinned relations are established with the County Durham in Great Britain, the Land Northern Rhine - Westfalia (Germany), with the cities Hyvinkää (Finland), Samokov (Bulgaria), Cetinje (Montenegro), Durham (North Carolina, USA), Dole (France), Aachen (Germany), Piotrków Trybunalski (Poland), Ochamchira (Abkhazia), Rovno (Ukraine), Bobruisk (Belorussia), Soroki (Moldavia), Sanmenxia (China), Bari (Italy).